Our new office furniture showroom runs the full gamut of styles. Here, you will find traditional, contemporary, transitional, and modern furniture made from a wide variety of woods, veneers, and laminates. We have conference tables, reception desks, workstations, and executive suite furniture on sale now. You will also find a multitude of ergonomic office chairs with the best prices in the city. Something is always on sale here at Cubiture because we want Houston companies of all sizes to get what they need at affordable prices. Find an ergonomic chair for every person in the office. Jerry is big on ergonomics. He has studied this science in detail and can tell you more about the subject than just about anyone in the industry. One of the things he makes is a point to do is to stock his showroom with 8-hour rated chairs. This is important because a large percentage of cheap office chairs are only rated for 5 hours. Jerry’s 8-hour chairs feature better support for the legs, lower back, and upper back and are suitable for persons of any body type. Find conference room tables and chairs in our new office furniture showroom. Cubiture has furniture made for conference rooms of all sizes. In addition to the very popular boat design, we have rectangular and oval shaped tables made from various types of wood. In the past, we have custom-built a number of conference tables with audiovisual equipment. We make it a point to find the best conference room chairs so that long meetings can be as comfortable as possible for those in attendance. Design a new reception center complete with ergonomic seating, filing and storage. Our new office furniture showroom has proven particularly invaluable in the Houston medical community. New office furniture for medical reception areas must meet certain compliance laws. Our custom built desks have exceeded expectations in these environments. Jerry’s high-density filing and storage systems have doubled and even tripled the space in smaller medical facilities. Find space saving desk systems for directors and C-Level managers. Cubiture owns its own factory and can manufacture desk systems that utilize the wall space in executive offices. This allows a manager to consolidated all personal files, a work area, and a small conference area into a single space. Office partition panels can subdivide a larger office into individual private areas if two or more executives need to share a single room. 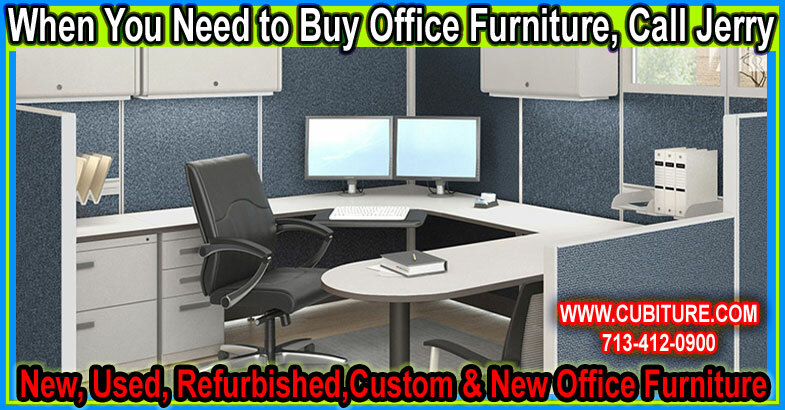 Find workstations for CSR’s, inside sales, and outbound marketing agents in our new office furniture showroom. We have several different styles of workstations build for outbound phone marketing, inside sales, and customer support. Most of our cubicles feature powered panels that allow your IT department to quickly equip your agents with the technology they need to do their jobs. Unique desk shapes maximize interior work areas. We can also customize panels with storage accessories, glass panels, and soundproofing so CSR’s can remain seated and focused throughout the day. Keep in mind that our West Little York factory can custom build anything you find in our new office furniture showroom. Because of our vast material selection, many of our custom builds actually cost less than showroom equivalents. We own our own trucks, and delivery is always free. Call Jerry now to schedule a showroom appointment and a free office design layout drawing.